Description: Palmer’s Cocoa Butter Formula Skin Therapy Oil On the Go Rollerball is a convenient, targeted, multipurpose skin perfection product that can be used all over face and body. This portable rollerball delivery system is ideal for multiple, on the go treatment applications. Cetesomate- E Complex along with our exclusive blend of key ingredients helps improve the appearance of scars, stretch marks, dry, damaged skin, uneven skin tone aging skin and fine lines and wrinkles. Skin looks and feels instantly soft and smooth with this unique non-greasy, non- staining formula. Cetesomate- E Complex is an integral component of our unique Rapidermal Absorption Systeme and helps improve the skin penetration and absorption characteristics of the formula into the epidermal layer of the skin. The Rapidermal Absorption Systeme helps our powerful ingredients penetrate deep into your skin for enhanced moisturization. This fast drying, non staining formula penetrates deeply without greasiness. The rollerball applicator allows for targeted spot application to problem areas. Directions: Gently massage into affected areas 3 times daily or as often desired. Ingredients: Canola Oil, Isopropyl Myristate, Cetearyl Ethylhexanoate, Sesamun Indicum (Sesame) Seed Oil, Dimethicone, Theobroma Cacao (Cocoa) Seed Butter, Tocopheryl Acetate, Fragrance (Parfum), Rosa Canina Seed Extract, Citronellol, Coumarin, Geraniol, Limonene, Linalool. Buy Online: For adding it in to the cart, click here. In case you wanna buy it offline, I recently located it in Big Bazaar counters. Packaging: I received mine in December 2016 Fab Bag and it is a deluxe sample which has lasted me for quite some time. 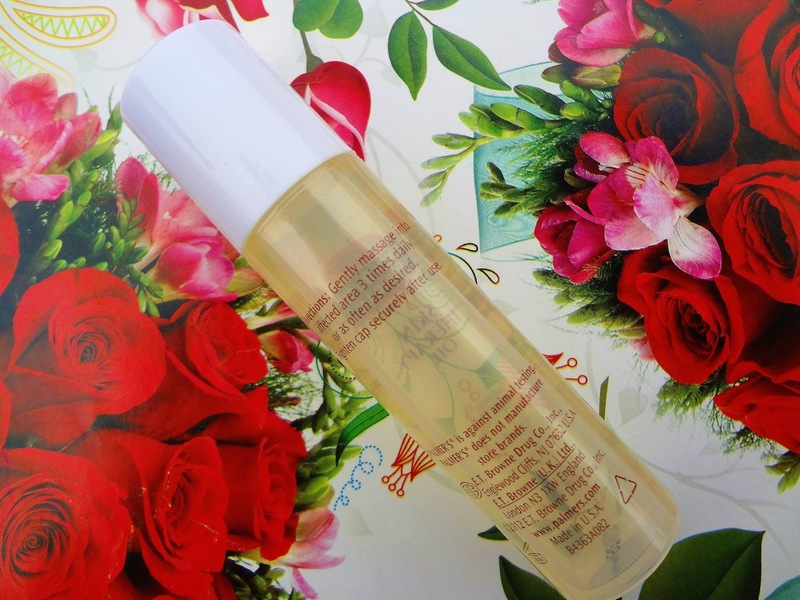 This Skin Therapy Oil comes in a compact rollerball form which eases in application to the desired spots. Also, it goes smooth in the under- eye zone. The packaging is sleek, travel friendly and leak proof. It has a screw top open cap; white coloured and a transparent body which makes it easier to view how much of the content has been left. 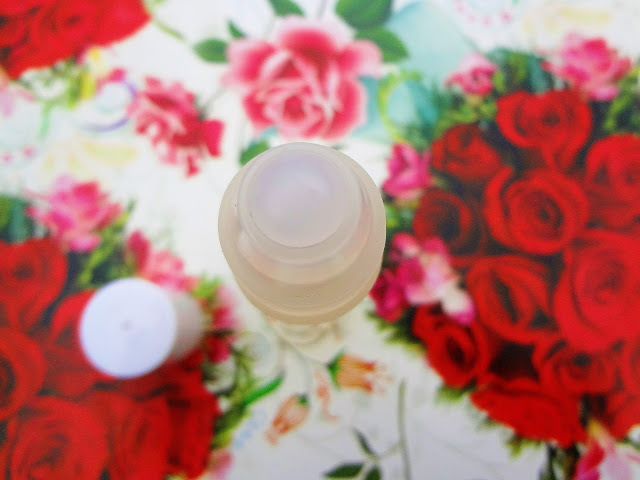 When I was done reading the outer packaging, my eyes lightened up!😍 This product consists of various hydrating ingredients that elevate itself to the pedestal of being miraculous. I somewhere read that in order to sustain the skin’s elasticity and glow, an adequate amount of moisturization is a must. Dry skin is more vulnerable in turning to wrinkles. And it also marks off early signs of aging. 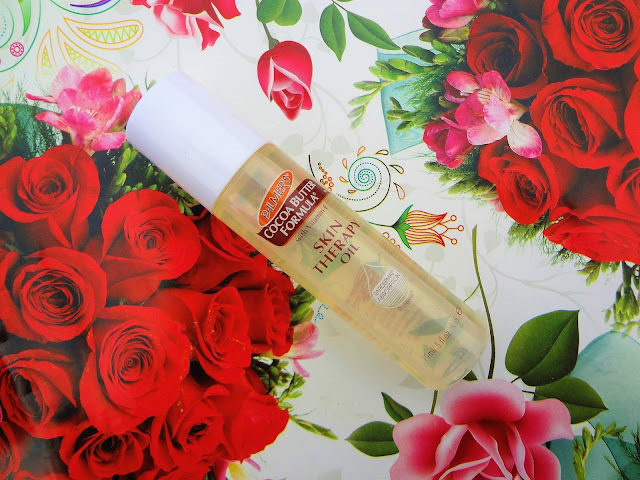 Palmer’s Cocoa Butter Skin Therapy Oil is light yellow in colour and the consistency isn’t heavy. Thankfully, it feels light onto the skin but you do need to massage it in a little. As mentioned in description, the formula isn’t greasy at all. I use the same onto the cleansed skin, before heading for my night sleep. It seeps in easily into the epidermis and provides immediate glow and dewy finish. In the morning, my skin looks hydrated, radiant, glowing and bright. It has also managed to smooth out my skin. I cannot really comment upon the stretch marks claim because I don’t have any. Also, the roller-ball applicator makes it all very fancy. But of course for massaging the content in, you do need to utilize your hands! Nice and detailed review. Thanks for sharing it.